It’s late, I have a meeting early in the morning, and I’m waiting for this damn printer to speed the hell up so I can get my vandalism overwith and walk home, which takes at least 90 minutes, and get a few hours of sleep. I have a feeling there will be a lot of caffeine in tomorrow’s diet. Luckily, I have Kindle for PC running on wine on my Linux-powered netbook, Kindle for Android on my delicious smartphone, enough juice to last me till tomorrow night, and I have discovered a delicious book series! Now, you should know that I haven’t read fiction in at least three years, so my taste has probably dulled since my heyday, back when I was making good progress through Robert Jordan’s Wheel of Time series. Those who have attempted to make it through that dreadful journey will know that the endeavor is enough to deter anyone from ever picking up a book again. 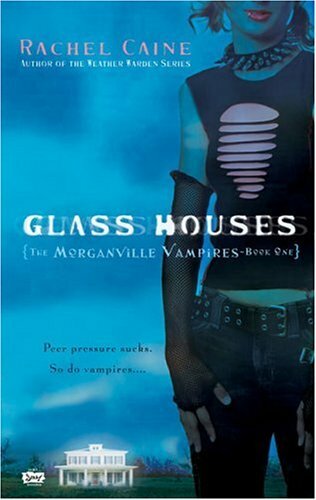 But that is another blog post entirely, this one is about Rachel Caine’s series: The Morganville Vampires. Please ignore the godawful pun. I could make this very, very short, and tell you that this book is like the Twilight series, and that would be all. Luckily, I would be lying, at least a little. At a distance, this series will indeed sound exactly like Twilight, it features an uncertain girl, Claire, of 16 years who moves to a new town, Morganville, Texas, where there be Vampires. Teen crushes ensue, etcetera etcetera. What makes this series enjoyable for me is that, while not as rich as the lore in Anne Rice’s works, there is enough depth in the history of this uncharming little town to keep me interested, and wanting to learn more. The beginning of the first book is a little annoying exactly because it misses this, the protagonist has to discover what’s wrong with the town before you as the reader can start learning about it. Luckily, this part of the book passes before you grow tired and put the book away, and by the time you’ve started to have your fill of Morganville (heh heh), you realize that you actually want to know what happens to the wretched little girl. It’s really quite clever, the girl gets you interested in the town, which keeps you distracted while it gets you interested in the girl. And yes, there’s a love story in there, but it never quite takes the top priority, which is nice, because really, if you wanted a bad romance novel, you should just pick up Twilight anyway. All in all though, at least halfway into book 4, the good outweighs the bad, and I enjoy reading again, and this was the series that brought an end to the dark times, for which I will for ever, or at least a long time, be grateful! You… You’re still here? Oh, you want a rating, don’t you? Everyone expects a rating once they realize that they’re reading a review. Hmm, alright, on a scale from 1 to 11, I’m giving it a sheep. Song of the Blog: The Birth And Death Of The Day, by Explosions In The Sky.